Having a swimming pool can be a wonderful thing. There comes a time, however, when every pool reaches the end of its useful life. This can happen for several reasons. Swimming pools, even the best in-ground ones, simply don't last as long as a home. For this reason alone, just about anyone who has a swimming pool will at some point need to remove or replace it. As swimming pools age, problems often arise with equipment, leakage, cracking, and they typically lose their aesthetic value. Swimming pools can also be expensive to maintain. Many people, once they realize that they no longer use their pool as much as they used to, decide that the best thing to do is remove the pool rather than continue to pay for its maintenance indefinitely. Complete Removal: Complete removal is just what is sounds like: the pool is completely removed. We leave no cement, no unwanted decking, no equipment or anything else related to the pool. The hole is filled with high-quality fill and compacted, thus returning the yard to its pre-pool state, without danger of sinking or instability. 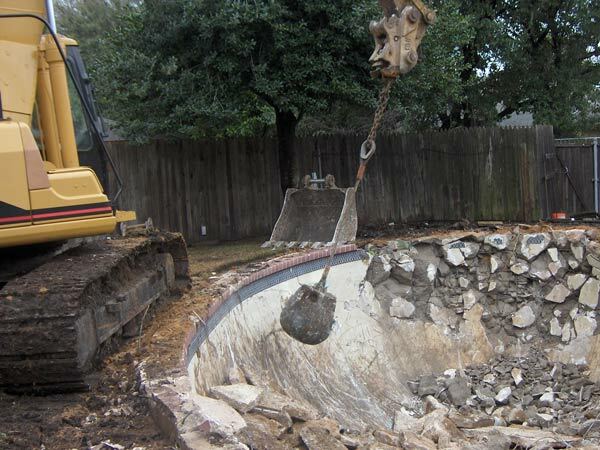 For more about our pool removal technique, see our "Our Process" page. Cave-in Technique: This method should be avoided, but it is used by some contractors. A "cave-in" involves simply knocking in the walls of the pool and breaking it up a little within the hole. The cement and debris is then buried and the new soil compacted. This almost always leads to sinking after a few years and eliminates the possibility of safely placing any structure in the area. Having the debris buried in your yard can reduce your property value by thousands. You could also be held liable for damages even years after you sell the property. This technique is illegal in some jurisdictions. We do not offer this method of pool removal.